Top NBA prospect Zion Williamson has been the story of college basketball this season. The freshman burst onto the scene with a 28-point, seven-rebound performance against Kentucky in his first game for Duke and has not slowed down. 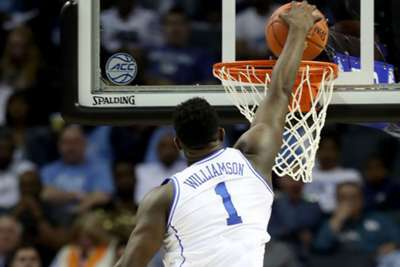 Williamson – who is averaging 22.1 points while shooting 69.3 per cent from the field in 2018-19 – sprained his knee less than 40 seconds into the Blue Devils' first matchup with North Carolina and missed the next five games. However, Williamson returned for the ACC Tournament and led his team to the postseason conference championship. Here are six stars worth watching in the NCAA Tournament. Williamson is arguably the best college player of this decade and has exceeded all expectations. He has excelled offensively and is almost impossible to stop in transition. He is knocking down 31.5 per cent of his three-pointers, as well, which is better than anticipated. The 6-7, 285-pound forward has also made an impact on the other end of the floor and should be able to protect the rim at the next level. He will almost certainly be the number one pick in the 2019 draft. RJ Barrett has shined sharing the floor with Williamson. The top recruit in the 2018 class has often been overshadowed by his star team-mate at times this season but has been almost as productive. He is leading the team in scoring and became the focal point of the Blue Devils' offense when Williamson was out with the injury. Barrett has struggled from three-point range but has solid form and a chance to improve in that area. He is projected to be selected behind Williamson. Ja Morant seemingly came out of nowhere and shot up draft boards in 2018-19. The Murray State guard is expected to be a top-five pick and could become the first player in NCAA Division I history to average double-digit point (24.6) and assist (10) totals in a single season. Morant and Murray State will face fifth-seeded Marquette in one of the most intriguing matchups in the round of 64. Jarrett Culver was the most effective player on a Texas Tech team that earned a share of the Big 12 regular season title. If Texas Tech make a deep run in the tournament, Culver will be a big reason why. He will be playing in the NBA next season. Rui Hachimura's game should translate perfectly into the NBA. The 6-8 forward followed up a strong sophomore season by increasing his production across the board. He is a reliable inside scorer that can also stretch the floor, as he has connected on 46.9 per cent of his three-point attempts. The Virginia wing was sidelined for his team's shocking loss to number 16 seed UMBC last season. De'Andre Hunter, however, was a major reason Virginia received another top spot in the bracket in 2018-19. On top of being a lockdown defender, Hunter has tallied 15.1 points and five rebounds per game while shooting 53 per cent from the field and 45.7 per cent from three-point range. He projects to be a top three-and-D player at the next level and has been compared to Toronto Raptors star Kawhi Leonard.